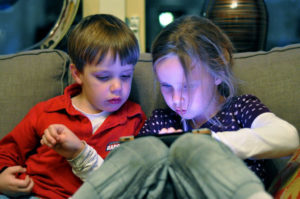 Is too much screen time making your Children Sick? 26 Jan Is too much screen time making your Children Sick? There is substantial research showing how too much screen time and internet use in children is linked to obesity, sleep disorders, anxiety, depression, autism, ADHD and other chronic disease. In a recent study, researchers found that children who reported spending more time on screen devices and watching television engaged in behaviors that can lead to Obesity. As debate rages between technology enthusiasts and skeptics on effects of EMF radiation, only time will present more evidence on the toxic impact of EMF exposure due to wireless and screen use. In the meanwhile, it will be prudent to take precautions and minimizing lengthy exposure, especially among pregnant women and children. First, limit the amount of screen time per day at home to the minimum possible. One strategy I have used is to limit screen time for playing games to 20 minutes on weekend. Reinforce healthy habits and active lifestyles in free time during which young ones can incorporate physical activity. Don’t use devices in the bedroom, take the TV, computers out of your children’s bedroom. Children who have TVs in their room spend almost one and a half hours more each day watching them than their peers. The temptation is huge but don’t make screen time as a reward for good behaviour, thus signifying its importance. Find and use more meaningful ways to increase good, healthy behaviour. Use dinner times to engage with your kids in conversation about their day or other things and do not fall to the temptation of using smartphones, tablets or TV at that time. Don’t allow use of technology at least for 2 hours before bedtime. Take a technology free vacation where the focus is on spending time together as a family and disconnecting from technology and screens. Find activities your kids love and do them together as a family. When you find an activity you enjoy as a family together, you’d have much more fun doing it together than sit alone in front of a screen. Just don’t make that activity Pokémon GO. Limit exposure to EMF with shielding devices. Modern lifestyle requires children to use their laptops, tablets and wireless for school and other activities. Limit the exposure to radiation by using exposure shielding devices that reduce harmful EMF radiation to virtually undetectable levels. Switch off the wi-fi when not needed, and definitely at night. Use a good wifi blocker to prevent interference from other networks in your house.